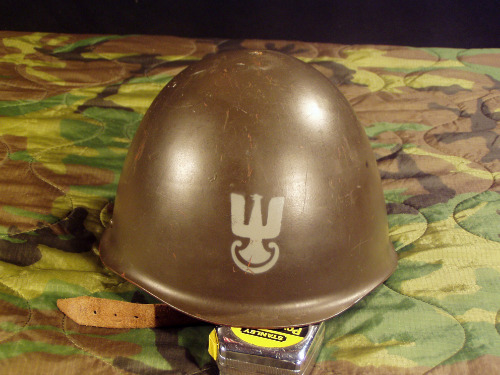 The improved liner is the only addition to this the last steel helmet produced by Poland, though looking very complex, the liner is actually very comfortable. The liners are completely removable, just remove the screw on top of the helmet and the liner unit can be removed. Size is not marked on liner, I believe it is small size. the leather liner measures from front to back 7"
From side to side 6 1/4"
the liner has a elastic expansion at the rear of the leather liner, it expands the size about half an inch.